I love happy mail and I especially love creative Happy mail. 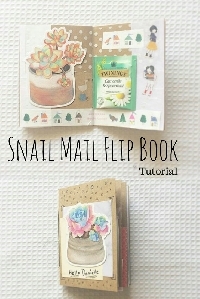 1) Create A Happy Mail Flip book YouTube.com has a lot of tutorials. Fill the pages with goodies The Theme is sender's choice. And as long as the "flip book" has multiple pages it doesn't need to be a traditional "book" style but can have flaps the go other directions if desired. Please Put some Artistic love into this!! Whatever goodies you can include in a cute creative way. 2) Include A nice Note card with a note. The swap name and your swap-bot user name. 3) Decorate the Envelope Front and back. And include enough postage. 4) If You receive A Snail Mail Flip Book Filled with goodies please rate 5 even If theme isn't your "style". Give a heart if it was personal to you or extra special. Please rate promptly as people put a lot of effort into swaps. 5) This Swap is Intensive so not Unrated swapper friendly. I check all profiles and ban at my discretion. This swap sounds lovely, however, you don't have a rating filter, so I am wary to join. Usually anything less than 4.98 is questionable for me.